Here are some notes on what makes a good one. Finding a good heather site can be quite difficult bearing in mind the often difficult terrain, security and the needs of the bees. This one above has pluses and minuses but overall it is a good one. Here’s a picture of the bees working yesterday (temperature only 12 degrees C) note the pale pinkish beige pollen loads. Bell heather is more white. Click photo for a close up. 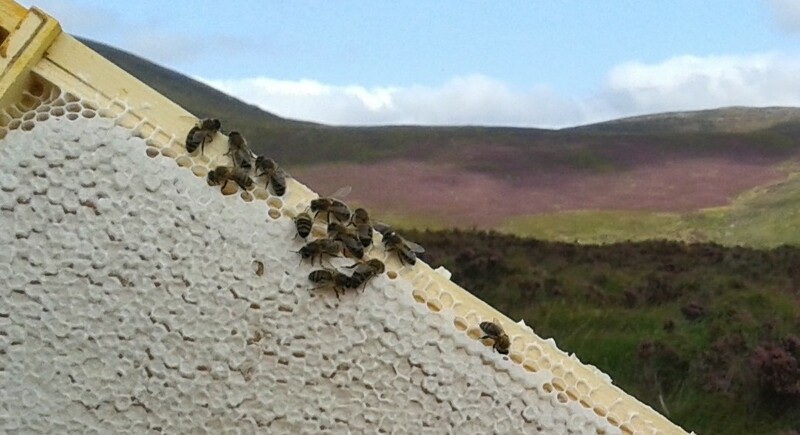 Only upland heather sites will give you pure ling heather honey. The altitude here places any ivy (Hedera helix) out of range if the two flows do coincide which has been known in the past. Pure ling heather honey does not granulate unless it has something else in it – especially ivy. If you are producing sections or comb honey that’s the last thing you need! There are patches of rosebay willowherb (Chamerion or Epilobium angustifolium pollen loads are blue) up here where the ground has been disturbed for forestry or the like. In previous years the bees have brought this in along with the ling but it didn’t seem to make the heather granulate and the flavour and colour was only slightly paler than pure ling. Not a problem then. It is secure and well away from public roads and footpaths. 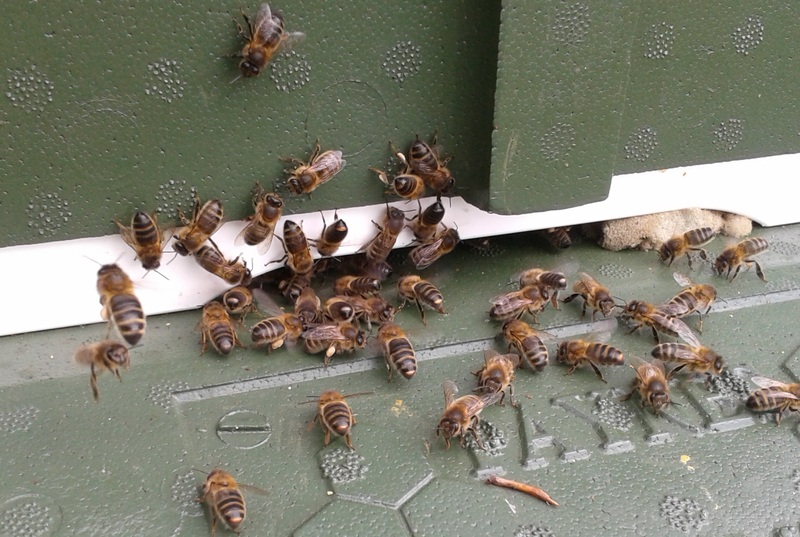 It can be very windy up here and that is hard on the bees if they are trying to fly although any cyclists out there don’t need to be told about the pros and cons of a strong head wind – especially if you head out into one. There are rather a lot of sheep on the hill but they have been recently shorn – at least one of these colonies is a bit on the assertive side and I trust them to look after themselves if anyone woolly comes rubbing. There are also deer and for the first time I saw wild goats here yesterday but they were at a respectful distance. Not sure how much of a threat they could be – they look rather hairy. Crocodiles (!) of hikers pass not far from here and the occasional lost one walks right by on the wrong track quite close to the bees. Fortunately the hives are not visible from the track. Even if they were – walkers aren’t usually the type to pitch stones or set fire to heather but you never know.